Batteries treated with Battery Equaliser last longer and perform better. A recent long term life cycle battery test conducted by an international battery manufacturer clearly shows deep cycle lead-acid batteries treated with Battery Equaliser have a significantly longer service life. The accompanying Capacitance/Ah (amp hour) graph of the test results shows the untreated batteries beginning to drop off in performance vs. the treated battery at the 200 cycle point. At 550 cycles the untreated batteries are considered depleted. 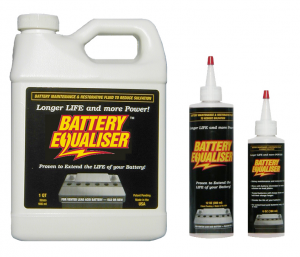 Battery Equaliser is a patented, water based, top up fluid, for both new and in service lead /acid batteries. It stops plate shedding and performs as an automatic electrochemical equalizing process to help prevent and remove over sulphation from the lead plates. Our technology helps maintain batteries in peak operating condition allowing them to charge faster and last longer. Battery Energizer can double battery service life, reduce charge time by one-third or more, and triple static shelf life. Battery Equaliser serves to reduce the environmental impact of battery production and their toxic disposal and provides substantial saving by reducing charging time and replacement costs. Battery Equaliser is ideal for use in all lead acid batteries, new or in-service : starting batteries, deep cycle, truck, automotive, RV, heavy duty equipment, marine, gensets, standby / back-up emergency power supplies, motorcycle, snowmobiles, jet-ski, military, municipal; mining, forestry, recreational, wind / solar applications. Please go to www.batteryequliser.com for international testimonials generated from the millions of batteries treated globally.